Bickley's Air Conditioning & Heating can professionally install a whole house fan in Red Bluff & Redding, CA. 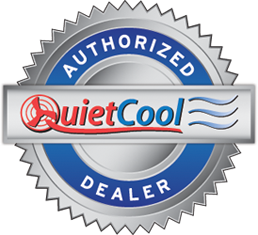 As an Authorized QuietCool Dealer, we've been through the training to install a properly sized fan to maximize your savings & can provide a longer warranty. 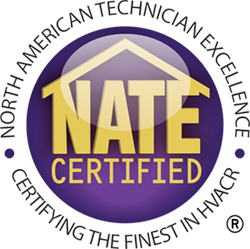 We provide whole house fan installation in Red Bluff & Redding and surrounding areas. A whole house fan is installed in the ceiling in a central location. When the fan is turned on it pulls the hot air out of the house and blows it into the attic. Energy-efficient, low-noise whole house fans are now available to solve these problems. Modern fans are suspended from the rafters and are connected to the ceiling grille with flexible duct. Dampers close when the fan is not running, sealing the air inside the home. These modern fans are so quiet and energy efficient that they make traditional whole house fans seem old-fashioned. You can enjoy the benefits of a QuietCool whole-house fan as an effective alternative or to complement your home air conditioning. Cooling is simple & cost effective, by bringing cooler outdoor air into the house you can use nature's own cooling system. 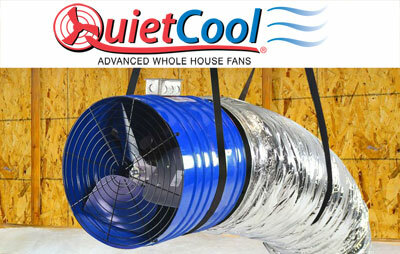 QuietCool is our most popular whole house fan system. They are very quiet, energy efficient and easy to install. They are also the least expensive of the modern whole house fans in Red Bluff & Redding. The fan itself hangs from the rafters and is connected to the ceiling grille by insulated, flexible ducting, which makes the fan very quiet. Internal dampers close when the fan is not running to seal the attic opening. The ceiling grille and damper fit between the ceiling joists. No joist cutting is required. Cool your home more efficiently with an attic fan in Red Bluff & Redding. During the summer, a home's attic temperature can get very high. This oven-hot heat can put strain on your home's air conditioning system as it attempts to cool the space. Installing an attic fan will easily removed the trapped hot air in your attic and assist your cooling system, making it a lot easier to cool your home. This added help from an attic fan can possibly reduce your cost of cooling by up to 30%!